The stylized “SS” logo appeared in a photograph of the platoon taken in September 2010 in Sangin district, Afghanistan, a hotly contested area in Helmand province. 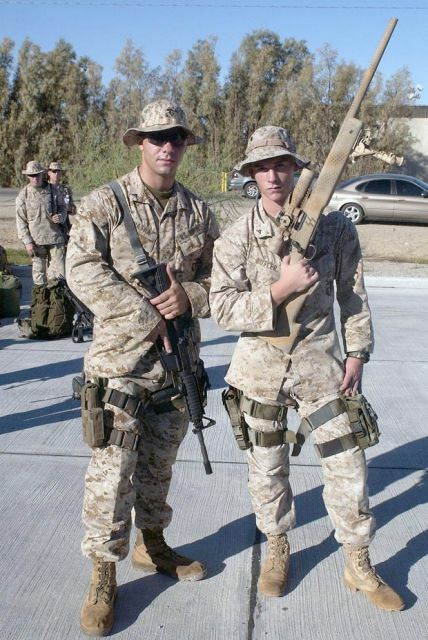 The Marines were with 1st Reconnaissance Battalion, out of Camp Pendleton, Calif. The I Marine Expeditionary Force inspector general based at Pendleton was made aware of the “SS” flag photo in November of last year, said Capt. Gregory Wolf, a spokesman at Marine Corps headquarters. The issue has been addressed with the Marines involved, Wolf said. He did not say what specific action was taken beyond ordering Marines to stop using the logo. The photo in question is not the only one documenting usage of the logo: A second image (embedded below) shows the SS logo emblazoned on a Marine’s rifle. 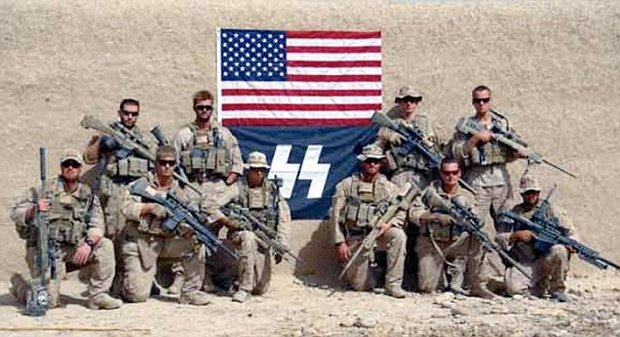 The Marines’ story is that the unit used the flag “to identify the Marines as scout snipers, not Nazis.” The symbolic appropriation may indeed be unwitting, but witlessness is no more desirable a trait in downrange warriors than malice is. Why is this making news now? Several Marines who were concerned about the photos contacted Mikey Weinstein (no relation), president of the Military Religious Freedom Foundation, a nonprofit that watchdogs religious intolerance in the armed services. Their behavior, Weinstein told me, “eviscerates good order, morale, and discipline,” in addition to angering non-Americans and alienating survivors of the Nazis’ atrocities. He published the photos on the foundation’s website and sent a letter to Gen. John Amos, the Marine Corps commandant, demanding punishment for the Marines involved. “That flag symbolizes the vile ideology of Hitlerian fascism and sends a menacing signal to religious minorities within the United States armed forces,” Weinstein said. The Corps says the matter has already been handled internally. “Certainly, the use of the ‘SS runes’ is not acceptable and Scout Snipers have been addressed concerning this issue,” Marine Capt. Brian Block told Politico in a statement today.